were prepared using DMSO, ethanol and acetone solvents, two different MGA plaques were used for each test material. Each experiment was made for 3 times with known results of mutagens and we made it ready for “Ames” test method. corrosive materials, and cleaning agents and others. activity or medicine excretio n into wastewater . 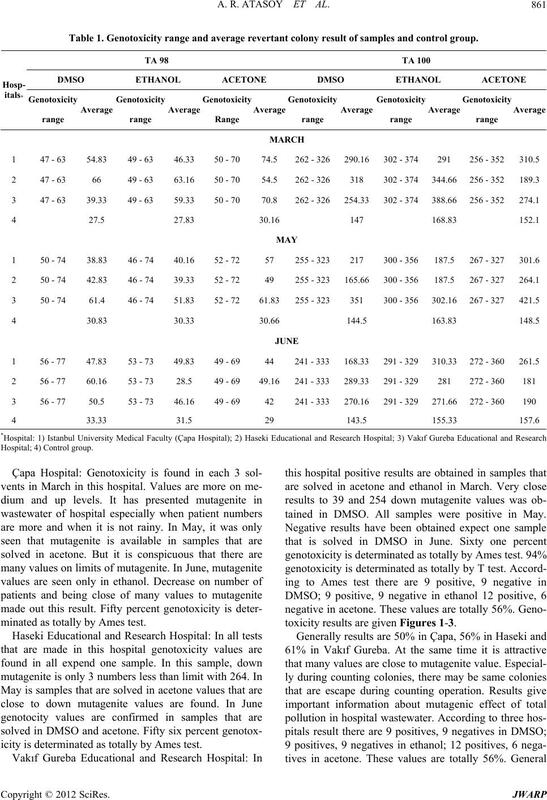 A. R. ATASOY ET AL. with few exceptions, have never even been identified. ible to have mutagenic effects ([9,10]). very close and their sewage water goes to same purifier. material. Each experiment was made for 3 times. uvrB deletion which extend s through the bio gene. before were tested according to resistance for amphisiline. tion, and ampicillin resistance have been identified . tion (1 mg/ml) were placed to the middle of plaques. bated for one ni ght in 37 ˚C . ples T test method for control of data. solved in ethanol more genotoxic than other in TA 100. 100, 2348 ± 132 . Table 1. Genotoxicity range and average revertant colony result of samples and control group. minated as totally by Ames test. icity is determinated as totally b y Ames test. tained in DMSO. All samples were positive in May. toxicity results are given Figures 1-3. Figure 2. 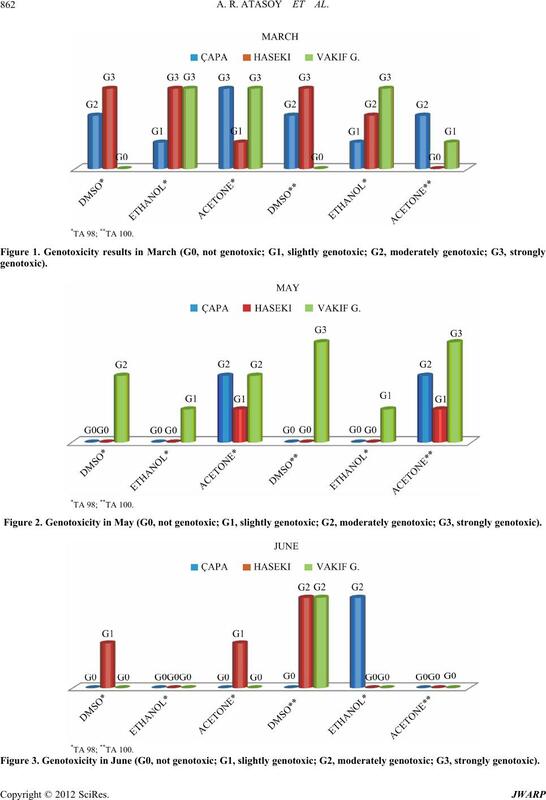 Genotoxicity in May (G0, not genotoxic; G1, slightly genotoxic; G2, moderately genotoxic; G3, strongly genotoxic). Figure 3. Genotoxicity in June (G0, not genotox ic; G1, slightly genotoxic; G2, moderately genotoxic; G3, strongly genotoxic). 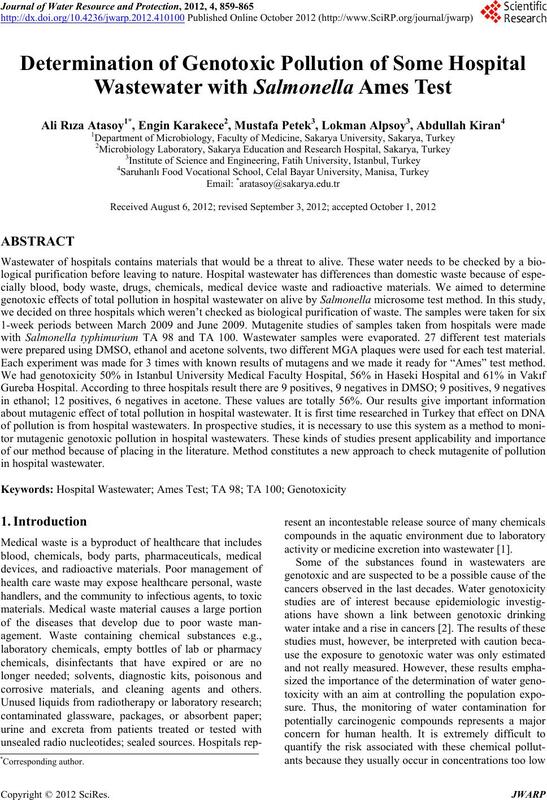 in ethanol more genotoxic than other in TA 100.
hospital release mutagenic wastewater to sewage system. samples generally not toxic because of patient number. samples that are solved in acetone and ethanol in March. some drugs and some pathogen bacteria are researched. see effects and defect of pollution in Istanbul Bosphore. Table 2. 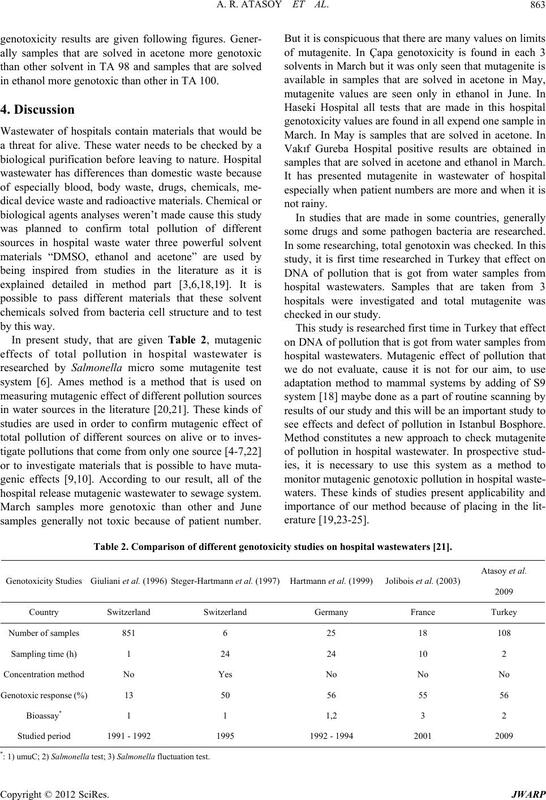 Comparison of different genotoxicity studies on hospital wastewaters . *: 1) umuC; 2) Salmonella test; 3) Salmonella fluctuation test. Chemosphere, Vol. 45, 2001, pp. 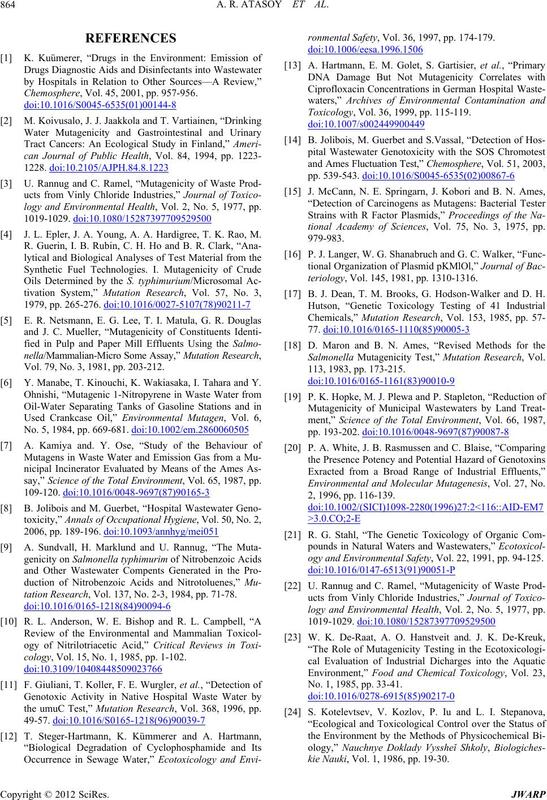 957-956.
logy and Environmental Health, Vol. 2, No. 5, 1977, pp. J. L. Epler, J. A. Young, A. A. Hardigree, T. K. Rao, M.
Vol. 79, No. 3, 1981, pp. 203-212. Y. Manabe, T. Kinouchi, K. Wakiasaka, I. Tahara and Y.
say,” Science of the Total Environment, Vol. 65, 1987, p p.
tation Research, Vol. 137, No. 2-3, 1984, pp. 71-78.
cology, Vol. 15, No. 1, 1985, pp. 1-102.
the umuC Test,” Mutation Research, Vol. 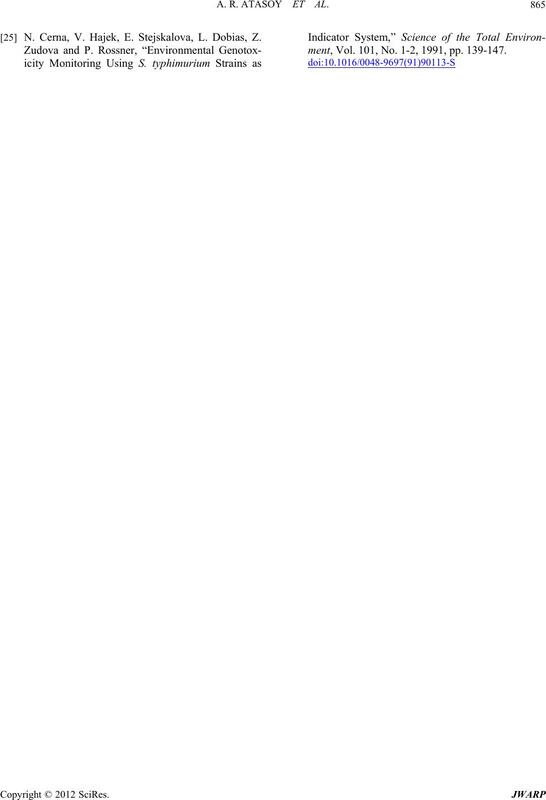 368, 1996, pp. ronmental Safety, Vol. 36, 1997, pp. 174-179. Toxicology, Vol. 36, 1999, pp. 115-119.
tional Academy of Sciences, Vol. 75, No. 3, 1975, pp. teriology, Vol. 145, 1981, pp. 1310-1316. B. J. 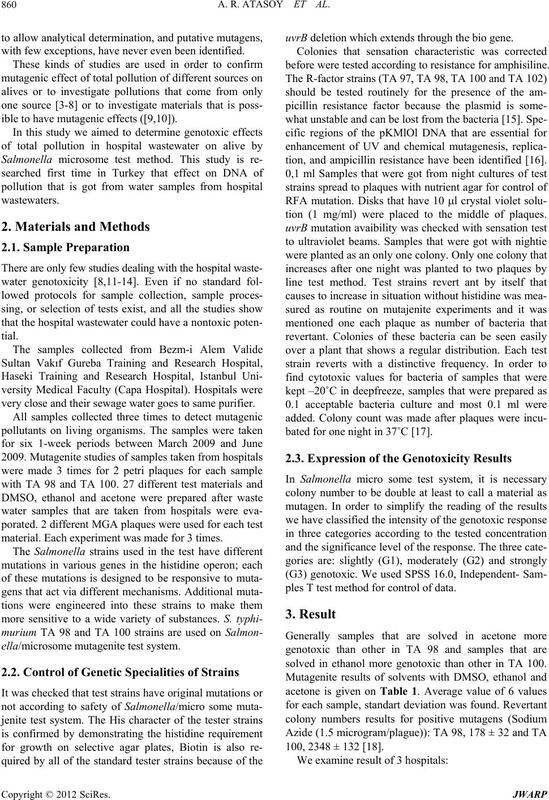 Dean, T. M. Brooks, G. Hodson-Walker and D. H.
Salmonella Mutagenicity Test,” Mutation Research, Vol. Environmental and Molecular Mutagenesis, Vol. 27, No. ogy and Environmental Safety, Vol. 22, 1991, pp. 94-125. No. 1, 1985, pp. 33-41.
kie Nauki, Vol. 1, 1986, pp. 19-30. N. Cerna, V. Hajek, E. Stejskalova, L. Dobias, Z.
ment, Vol. 101, No. 1-2, 1991, pp. 139-147.